Cookie was in ecstasy. Her eyes had that far off, glazed over look, and her stubby tail waggled furiously as Gowan scratched between the sheep’s ears. Glenda, the matriarch of the flock, evinced a more dignified pleasure at the head scratching. Very pregnant, she remained quietly lying down, receiving the friendly rub as her rightful due. “The sheep are a vital part of the farm,” Gowan said as she stood up and young spring lambs bounced shyly away. “We rotate where they graze to control invasive plants like gorse and break down cover crops in preparation for planting. The sheep also help fertilize the soil. Plus, they’re just so darn cute!” We had to agree. Those friendly wooly faces were the perfect ambassadors for this farm manager’s crusade for more sustainable, holistic agriculture. Gowan at work on the farm. Born down in Gualala, Gowan Batist grew up farming and working with animals, and in so doing foster a deep connection to the land and the local community. When she moved to Oregon for college, her initial focus was on the art of metal work. It never crossed her mind that few volunteer gigs she picked up working on community gardens and farms would eclipse her life as a metal worker. Before long, she was totally immersed in the intricate science behind soil conservation, carbon sequestering, and what all it takes to implement a happy, healthy, completely organic farm. 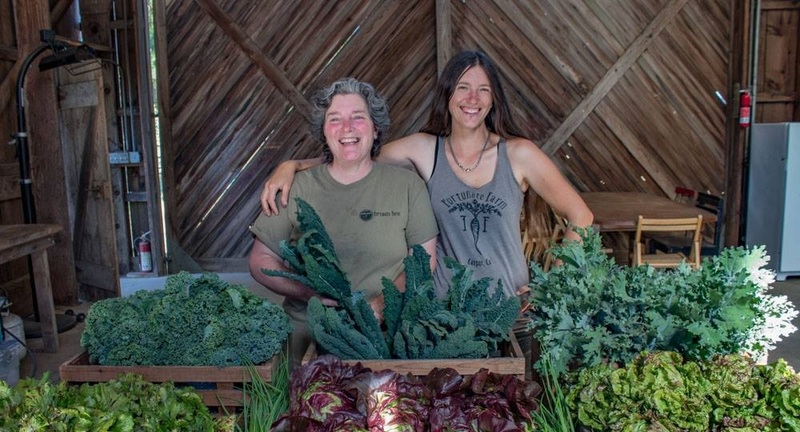 Having found her passion, she moved back to the greater Mendocino area after graduation to manage Fort Bragg’s Noyo Food Forest, a program dedicated to connecting people back to the land through education and community gardens. Searching for a place in which to further pursue her own dreams of what ag could be, Gowan partnered with her mother Ellen, step father Jef, and a few other like-minded folks to open Fortunate Farm about five years ago. In addition to the practice of rotational grazing with the sheep, they have been experimenting with symbiotic companion gardening, natural irrigation, and the right combination of cover crops to promote the soil’s microbiome, as well as a host of other strategic design factors. The 40 acres of the farm aren’t the only beneficiaries of Gowan’s passion for conservation and environmental health either. A big picture kind of thinker, Batist is just as committed to the community and world around her as she is to her own farm. She works closely with the Mendocino County Resource Conservation District on carbon sequestering projects. She has been experimenting for several years with spent hops from the North Coast Brewing Company for healthier compost and more effective ways to get rid of the pine bark beetles that have been slowly killing off so many of the pine trees on the Mendocino coast. She serves on the boards of the Mendocino County Farmer’s Market Association and the Community Alliance with Family Farmers. She also actively participates in several other community organizations and donates some of the farm’s produce to the Caspar Community Center, the Fort Bragg Food Bank, Project Sanctuary, and the Senior Center. All of a sudden, our conversation was interrupted by Fox, the resident border collie, as he whizzed by, happily chasing a bucket he’d rolled out from behind the greenhouse. “Look at him go!” We laughed, watching him tumble through the long grass with his new toy. As we got in our cars and waved goodbye to Gowan, we knew we’d return soon – with their farm stand opening up for the season on April 6th, we’ll be back for the beautiful fresh produce and flowers and to say hi to Cookie, Glenda, and the rest of those adorable sheep. Gowan and her mom Ellen. Pick up lovely flowers and seasonal produce at the farm stand and say hi to the critters every Saturday 11:00a-5:00p starting April 6th. Catch the crew at both the Mendocino Farmer’s Market on Fridays 1:00p-3:00p and the Fort Bragg Farmer’s Market on Wednesdays 3:00p-5:00p beginning in May. Take a yoga class in their garden on Saturdays 11:00a-12:00p in summer months. Check back for updates on sheep shearing demonstrations and wool working classes! And follow them on Facebook for the latest information on all their activities… or just binge on all their adorable pictures! !